A very modest lady who was unaware of all the masters records she holds. 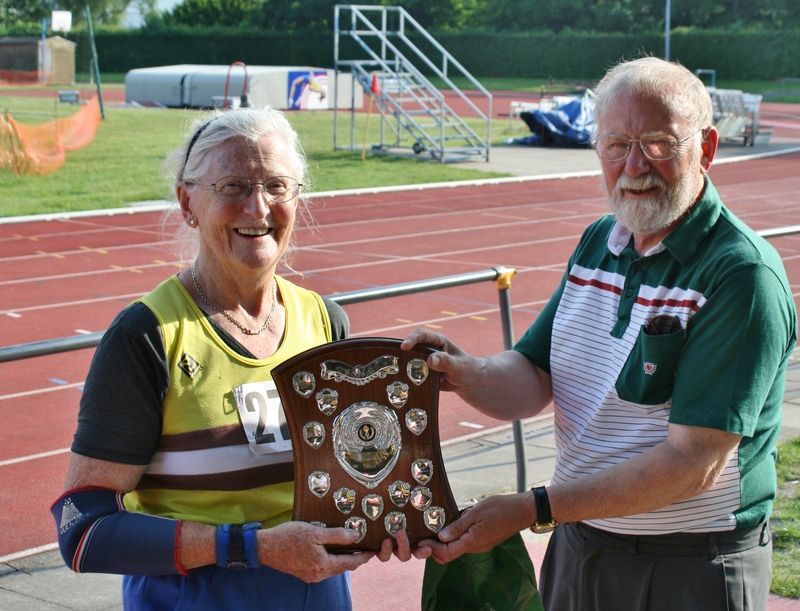 We are all proud to have Rosemary as a member of Midland Masters. Our thanks go to Bridget Cushen who has dug deep to compile a list of Rosemary’s achievements. Rosemary Chrimes (nee Payne) World Records. 15 March She set a W50-54 Age Group World Indoor Shot Putt record 12.48m, then aged 52. 25 March Aged 54 she set a W50-54 Age Group Indoor 60m Hurdles World Record in 11.5sec. 26 March World Indoor W55-59 Age Group 60m hurdles, 11.1sec. 26 March World Indoor W55-59 High Jump record 1.36m (4’.5½”). This Age Group Record stood for over 10 years. 26 March World Indoor W55-59 Triple Jump record 8.57m. Stood for 10 years. 26 September Jumped 1.30m for a World aged over 60 high jump record. Set a World Discus record of 37.56m that was not broken until 2002 by the former East German double Olympian, Karin Illgren. 1 March World Indoor High Jump record, clearing 1.30m then aged almost 64. 7 June World W70 Shot Putt record, 11.02m, record still unbroken. 10 June World W75 High Jump record 1.18m aged 79, record still stands. 23 times a World beater! !